So One New Change hasn’t been allowed to impose on St Paul’s, but what it has done is to give us some great new views. Coming up the escalator with the dome appearing in front of you is a wonderful experience, as is riding in the glass lift; the panels in the central atrium reflect views of the Cathedral so that you’re aware of its presence whichever way you look; and on the sixth floor is a terrace that puts you on a level with the roof of St Paul’s – you feel like you can almost reach out and touch it. Although it’s covered in brown glass the building is also relatively ‘green’ (I’ll get my coat). It’s partly heated and cooled by geothermal energy – they drilled down 150m to tap into that – and a coating on the glass panels limits the heat absorbed by the sun, which reduces the amount of cooling needed. 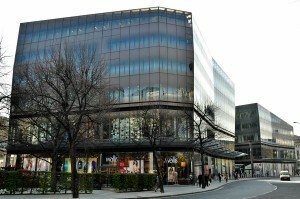 The thing cost £500 million in total, has 6,500 floor to ceiling glass panels, and was disapproved of by Prince Charles. 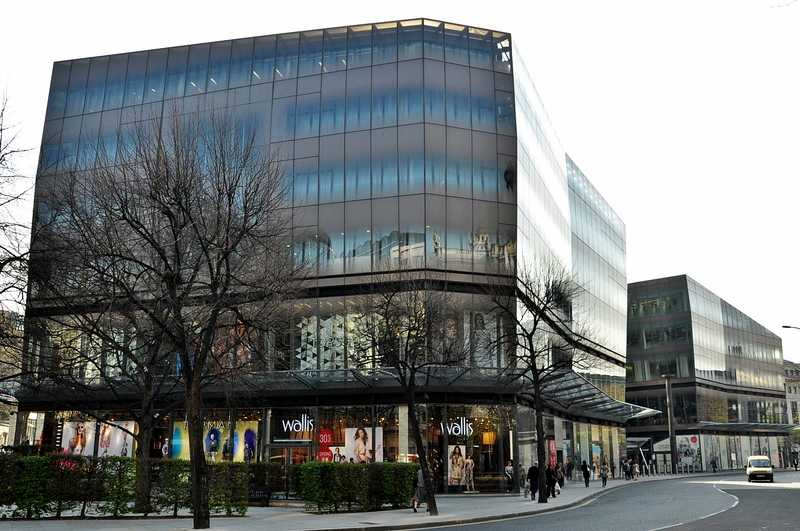 One of the terms of the planning approval was that the shops and restaurants in One New Change had to be open seven days a week. Because the City’s population is almost entirely migratory – over 300,000 people a day coming in to work then going home – the Square Mile is packed solid Monday to Friday and much emptier at the weekends. Until recently nearly all the shops and pubs were closed on Saturday and Sunday – many of them still are – so having One New Change open seven days a week is an attempt by the City Corporation to boost footfall in the area. I think it’s still fair to say though that it’s a pretty relaxed retail experience here at weekends – you won’t have to fight to get served.